For the moment, the total population of Africa exceeds one billion, representing just over 15% of the world’s total. The following graphic paints a compelling picture of the current composition of the world’s population, how it will change further through 2050, and the increasing share of the global population that Africa will gain during this period. 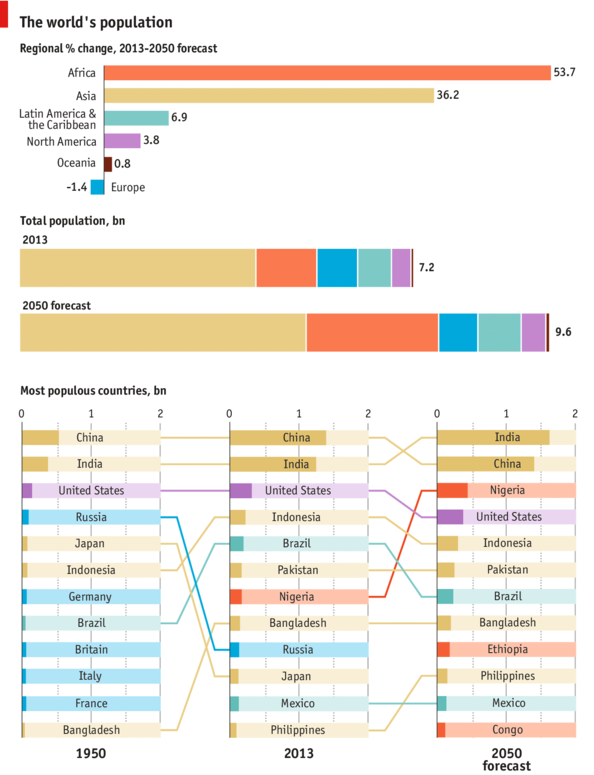 Global population patterns through 2050. Sources: UN, The Economist. Suffice it to say that Africa’s numbers make it a hotspot to watch in terms of international students. So how many Africans are staying home for their education and how many are studying outside their country? Are those who do elect to study abroad travelling overseas or within the continent? The French government has released a report that answers just these sorts of questions, La Mobilité des Étudiants d’Afrique Sub-Saharienne et du Maghreb, and it finds that there have been some shifts in the choices of African students studying abroad. For a primer on the Maghreb region, please see here; for one on the Sub-Saharan region of Africa, please see here. Of the 380,376 African students electing to study abroad in 2010 (representing roughly 10% of the world’s international students), 29.2% went to France, allowing France to retain its position as the #1 destination for African international students. However, South Africa, the #2 destination, has been gaining in market share relative to France since the last time the study was conducted. Its share of 15% of African students represents an increase of 28.8% since 2006, versus France’s decrease of 1% in that time. France is overwhelmingly the choice of Francophone African students (only 2.6% of the Africans studying in France are from English-speaking African countries), and most of the African students in France are from Morocco, the Maghreb, and Francophone Sub-Saharan countries. Its level of development, close to that of European countries, offers interesting professional prospects for students. Its public universities are of high quality. At the University of the Witwatersrand, which specialises in engineering and technologies, 20% of students are from another African country and they include a high proportion of Francophones. University World News also makes notes about the allure of Morocco (for French-speaking Africans) and Angola (for Portuguese speakers). The United Kingdom and the United States come in third place as a study abroad destination for African students, commanding a 9.7% share each. However, the UK has gained in share (+19.3% since 2006) while the US has declined a little (-2.3%). Germany is in fourth place with 4.7%; it registered a decline in share since 2006 as well (-4.8%). Other contenders are emerging for African students from the Sub-Saharan African region (mostly English-speaking) in particular: Italy has increased its numbers of African students from this region by 54% since 2006, Canada has increased them by 42%, and Morocco by 50%. Which African countries hold the largest proportions of students engaged in study abroad? Last year ICEF Monitor published a special feature on recruitment in South and Central Africa: please view it here. The Campus France report found that various regional hubs in Africa are increasing in popularity to African students (i.e., instead of going to Western Europe or North America, African students are increasingly staying on the continent). Clearly, Africa is on the move – both in terms of its students’ mobility and in its reputation as a study abroad destination in its own right. This entry was posted in Africa, Higher Education, Morocco, Most Popular, Nigeria, Regions, South Africa and tagged Most Popular, higher education statistics, student visas, tertiary education overseas, international students.